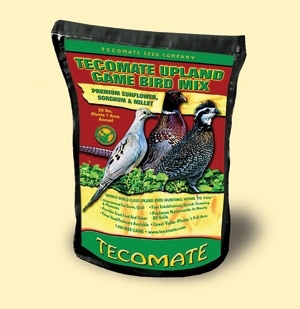 Tecomate Upland Game Bird Mix - 20 lbs. Tecomate Upland Game Bird Mix Seed - 20 lbs. Argentine sunflowers, millet and hybrid milo. UPLAND GAME BIRD MIX, our first venture away from deer management, feeds dove, quail and pheasants like nothing else on the commercial market. Originally produced for our own enjoyment and the time honored tradition of having the best Labor Day dove hunt. Upland Game Bird has become a mainstay across the country. Birds love and need seed producing plants. Our wildlife biologist and agronomist developed a mixture containing Hybrid Sunflower from Argentina, Millet from the Western US and Hybrid White Grain Milo from Texas. The Sunflowers and Milo bring in migratory white wing and morning dove while quail thrive on our grain producing millets and milo. Pheasant also make their home in our low tannin milo and sunflower. The combination of the three crops growing together provides more cover and variety than any single monoculture could ever deliver. Upland Game Bird provides nutrition, attraction and habitat for all classes of North American game birds. This mixture works throughout the country in all zones, East and West. 1) Plant in a sunny location that has been disked to a clean, level and firm seedbed. 3) No-till drill, cultivate and broadcast or cultivate and drill seed. Plant at a rate of 20 pounds per acre. When broadcasting, cover seed by dragging, cultipacking or lightly disking. Plant ½ inch deep in good moisture. Tecomate LabLab Seed - 20 Lbs. Tecomate LabLab Plus Seed - 20 Lbs. Tecomate Chicory Food Plot Seed 3 Lbs. Tecomate Max-Attract Food Plot - 40 Lbs. Tecomate LabLab Seed Plus - 11 Lbs. Tecomate Deer Pea Plus Seeds - 11 Lbs Tecomate Brassica Seed Jar - 1 Lb. Tecomate LabLab Seed - 50 Lbs.